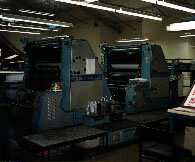 The dominant noise source from a printing press came from the second print head air drum. Secondary noise sources included drying fans and suction systems. Together these generated A-weighted noise levels of up to 95 dB. Given the size of the press (some 3 m x 8 m) and the access requirements, an acoustic enclosure was ruled out. As the majority of energy was high frequency, and therefore directional, the solution was to shield the major noise sources with acoustically absorptive material, strategically positioned in the direction of maximum noise radiation. Plain polycarbonate sheet was used for the viewing panels and 20 mm acoustic foam was placed inside the existing guards to provide absorption of the radiated noise. The cooling air passages to and from the press were silenced by adding cowls lined with absorbent material. A noise reduction of about 11 dB. Photographs courtesy of Medica Packaging Limited. Noise survey conducted by Industrial Noise and Vibration Centre.